Scented inks are one of my favourite discoveries. Not only does the scent add an extra mood-setting element for my writing space, but it is also a reminder to consider all my characters’ senses as I attempt to communicate their experience with my words. Scent is also a powerful memory agent which, I find, transports me with full sense and emotional memory in a way that words, or even pictures do not – and mining those rich veins of emotion is an important tool for a writer. Of course, the power of scent is dependant upon the scent being, Goldilocks style, “just right.” The wrong scent can distract and repel as powerfully as it can draw you in, and getting it right is not easy. I find in perfumes and food flavourings, as well as ink scents, florals are often powdery or soapy, and fruits and other flavours are often more like milkshake syrup versions rather than true scents. 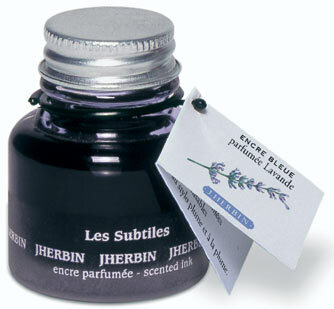 When I saw that J Herbin had a range of fruits and floral scented inks, “Les Subtiles”, I was eager to find out if they were any good – particularly the rose, violet and apple, which are three of my favourite scents. You’ll see over the next few posts that my impressions are … mixed. As they do for some of their calligraphy and dip-pen pen inks, J Herbin offers a sample set of “Les Subtiles” (pictured above) with five 10ml bottles of all five colours in the range: Rouge; Bleue; Violette; Vert and; Ambre. The bottles are not the same shape as the full size, pictured left, but they are good quality glass with silver-coloured tin lids, which are a little flimsy but do the job perfectly well. There is a dearth of pen shops in Sydney, and the few that exist don't regularly stock such specialty inks, so I ordered my sample set from Pear Tree Pens, in the States, and it arrived in Sydney in 5 days! If you are an artist looking for an artist’s review, I highly recommend my favourite ink review blog (which inspired me to start reviewing ink here) The Spiritual Evolution of the Bean where the inks Stephanie reviews and all their shading potential are shown off in magnificent mandalas. I couldn’t find a review of “Les Subtiles” on “The Bean” but the index of her reviews of Herbin inks makes me a little jealous that she has had the joy of sampling so many! On with my first ink review! I’ve started with the best of the lot, the colour is a lovely, deep, red on the blue side of the red spectrum (where I like my reds to be), and the scent is that of true roses – nothing powdery, soapy or fake about it at all. In both scent and colour, it is very similar to Mont Blanc’s Love Letter ink. You can see the similarity of colour in the sample pictured below, the first two lines are the Herbin and the second two are the Mont Blanc (I know I’ve written it but I’m fully aware that my handwriting requires some translation!) The fourth and fifth lines are a sample of Private Reserve Dakota Red, written with a very wet Parker Sonnet, which is a Red on the yellow side of the red spectrum, if only just. It’s personal taste but I think it wins out over the Mont Blanc on two points: First, the colour dries without any hint of brownish tones (the Mont Blanc on Ivory or Cream paper can look as though the message is written in blood – I suppose that’s romantic to some, but not to me.) Second, while I hadn’t considered the Mont Blanc to be a powdery scent (I use the term ‘powdery’ in the perfumery sense), when I smelled it to see if, perhaps, they were the same ink, it is definitely less subtle and slightly more powdery than the Herbin. I will definitely be purchasing a full sized bottle of this one, I can see the 10ml going quickly! Note: This is the first in a series of reviews on the five inks in J.Herbin’s“Les Subtiles” scented ink range. For a review of the “Ambre” ink, see the second post in the series. For a review of the Bleue ink, see the third post in the series. For a review of the Vert in, see the fourth post in the series. For a review of the “Violette” ink, see the fifth post in the series. #StoryCraft Transcript - "Story" vs "Writing"